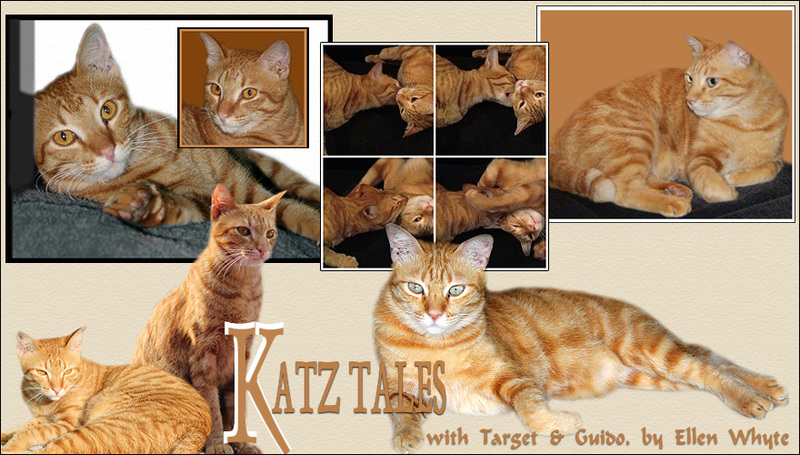 Katz And Other Tales: Guido Says Goodbye To Soup! Last week I met up with Loretta Shepherd, a local turtle expert, and we took Soup to a secret location and released him. He is now free, and living with other Malayan Box Turtles. Hopefully, he'll have lots of little dinosaurs and become a big noise in his pond. Guido, "Hey man, I hear you're leaving." Soup sets out in his new home. Safe and free again. Awww, that is so sad for Guido, but probably best for Soup. Hope he has a happy and long life. Guido, tell Mom to get you a stuffed turtle to help soothe you. I'm sure Soup will be happy in his new home and I'm sure he will miss you guys ! Aw, poor Guido. We're sorry your friend , Soup had to go away, but he'll be better off with other Soups. Ah poor Guido. But I am sure that Soup will be very happy with the other turtles. (((HUGS)))) Any hope of mom getting a plush Soup? purrr...meow! That's kind of sad and kind of cool at the same time! sorry to hear your buddy left, but he would be much happier where he went. Awwww how wonderful for Soup!! Yay!!! Me and Charlie are so happy he is free and safe now!! Awww sweet Guido!! Sorry you had to say goodbye to your friend but I'm sure he'll never forget you! Yay! Lump in throat from looking at pictures. Can't talk now. Maybe talk later. Sad. Good luck little Soup, you pal will always remember you! It's great that Soup has gone to join his turtle friends. We know you will miss him Guido but he will always remember you. This is just like that movie Free Willy. So glad that Soup is back to his ole place and will be happy to meet up with other turtles. Way to go. Bye bye Soup. May you be well and happy with your new friends. How sweet that the two became friends. Guess Guido will miss his turtle friend. I'll bet Soup will be happy with the other turtles. Hello and thank you for visiting us! So happy to meet you and your family of cats! Good luck to Soup...even though poor Guido will miss him. Guido is a sweetheart. Blessings to Soup on his journey. Aw, I love that first shot! Good luck to Soup, wishing him well in his new place. Guido is so cute! That I call a "Happy End" Guido will find another pet, maybe a mouse ? Glad that Soup got to go live with other turtles - but poor Guido. this problems are very familar to me. Once on my pond sat a little turtle. Not a domestic one, it was an escaped pet. We kept it some time in a water tub and when the winter arrived we bought a big aquarium for the house. In winter time we let it walk in the kitchen sometimes and this turtle, named Flossie, was really clever. It doen't flounder when I carrie it to the kitchen but did heavily when I brought it back to the Aquarium. In summer it lived outside in its private area with a tub pond. Once it was so big that it doesn't fit into the Aquarium. So we brought it to a big lake where hundreds of turtles live. I will never forget the look in its face when it slowly dived into this new world. Flossie knew from the first moment, this is how a turtle is supposed to live. Soup will have a fantastic life and surely she will ever remember you and Guido. Awwwww! We have a similar story, too. Though my cats were a bit afraid of Vincent, as I named him. 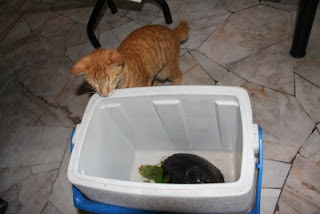 Wonderful pictures of the turtle and kitty!! goodbye Soup. hope you'll enjoy your new environment. Me too think that Mr Soup will love life in his new home and sure he will miss you !! aww, don't worry Guido. Soup is much happier in the big water with his own kind. maybe you can visit some day? good thing you have siblings to keep you company. Aww...poor Guido. We know what it's like to get attached to a pet. Get the female to get you another pet...even an interactive, toy pet is good company.